It demands a little prep work, but taking your baby on an adventure will set you free. 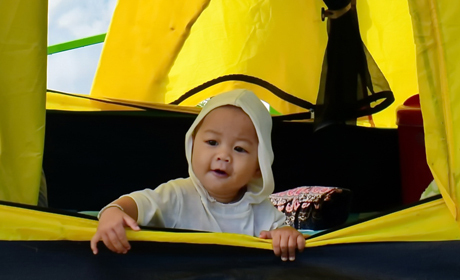 Camping with your baby can be fun and liberating, but it can also be intimidating. Infants are complicated creatures, and sometimes it feels hard enough to meet their needs with a house full of resources, let alone out in the wilderness on a camping trip. Camping's not just for the childless. Here are tips and encouragement from baby-camping veterans to inspire you to give it a try. Sarah Lambert is a seasoned family camper who started both her girls camping as infants, and she even camped while she was pregnant. “I think my life is easier when we are camping, and I have more time for fun and adventures with my girls,” Lambert says. She captures the paradox: although it takes a lot of preparation, taking your baby into the wild can ultimately break you free. You leave behind the pressure to make everything perfect and get to see how well your family and your brain thrive on simplicity. While parents get restored by laid-back hikes and starry skies, infants delight in watching the trees and birds. Older babies love exploring this new world of bugs, rocks and sticks. Fretful minds unwind away from the multitasking demands of home. Yes, it will be hard, but after a period of adjustment, peace will come. Be ready to try different things, and give it time. It may take two nights of thinking the apocalypse is nigh before your little one finally believes tenting is OK — you might find sleep on the third blissful night. In addition to bringing a variety of familiar, soothing stimuli, keeping close to usual schedules of bedtime and naps (even short ones on walks or drives) helps Baby re-establish rhythm. Starting a bit early with a relaxing bedtime routine in the tent also helps prime the pump for comfort and rest. Given that Baby's experiencing a major adjustment, meltdowns are inevitable. The great news is that many of the best baby-soothing strategies are intrinsic to camping like a baby carrier, or focusing on sights and sounds like a babbling stream or the wind in the trees. You will also have bottles, soothers and breastfeeding available. If all else fails, take your baby into the car for a little privacy and just wait it out. It will pass, and your fellow campers will survive. Pack clothes in multiple layers of quick-dry fabrics with warm features Baby can’t squirm out of (hoods, footies and fold-over hand cuffs rather than blankets, hats and mittens). Expert infant campers Ryan and Verena Tarves have another elegant solution. They pack a few pairs of synthetic body suits and use them as a light outfit for splashing and roaming around in the midday heat. They also use them as a dry under layer at night. For cool evenings and sleeping, they top the suit with a hooded and footed fleece suit with fold-over hand covers. Another smart move: plan the location and the season of your trip so it will not get too cold at night. Tennessee days and nights are warming up, but night temps can still get low in spring and early summer. Heather Lee Leap managed to keep her baby warm on a substantially cold night. “We camped in the mountains around freezing at night with a toddler. We bundled her in polypro long johns, a fleece shirt, leggings and her fleece snowsuit ... with the hood up. She slept between us, and we didn't worry about her getting out from the covers!” Once you've conquered these three camping conundrums, you'll be ready to find your family’s bliss in the woods. Pick up that baby, pack up that tent and go have a wonderful, relaxing time in the bush. by Kiera Ashford You'll need somewhere safe for your baby to sleep, right? The Phil&Ted Traveller Travel Crib ($149.99) is a light-weight, easy set up portable crib that functions as a place for your little one to sleep and play. The self-inflating mattress adds a little cushion to the bottom, too. When you're at your campsite or if you decide to go on a hike and enjoy a family picnic, you'll want a ground covering for him to sit on. The Posh Play Mat ($98) is super chic, eco-friendly, reversible play mat is made of PVC free faux leather and is 50″ x 45″. It’s a portable, wipeable play mat that you can use indoors or out. It’s super stylish and durable, too. So, while you’re sitting on the ground with Baby and having a good time, you don’t have to worry about any moisture from the ground seeping through and getting on your clothes. If you’re indoors, set it out for your little one to crawl around on. Or, when he’s older, put it under his high chair or play area to catch any spills. This size comes in eggplant, grapefruit and turquoise. They also have other sizes and products made from the exact same materials (available in a few colors and prices vary). Of course, Baby needs his own camping chair. The little ones that are shaped like the adult ones are not sturdy enough for baby and don't hold him in. However, the Ciao! Baby Portable High Chair ($59.99) is light and sets up quickly — and it's sturdy. It features a cup holder, wipeable table surface and straps to buckle baby in. It's a camping chair just for baby! You'll want something to carry Baby around in that's both comfortable and light. While we find that for small babies, a sling is easier, you might want to go for something bigger for older babies. The DeuterKid Comfort 3 Child Carrier ($224.19) is available at REI and could be the pack you're looking for. It features a height-adjustable seat, integrated sunroof and adjustable fit — your back and shoulders will thank you for all the extra support, too.